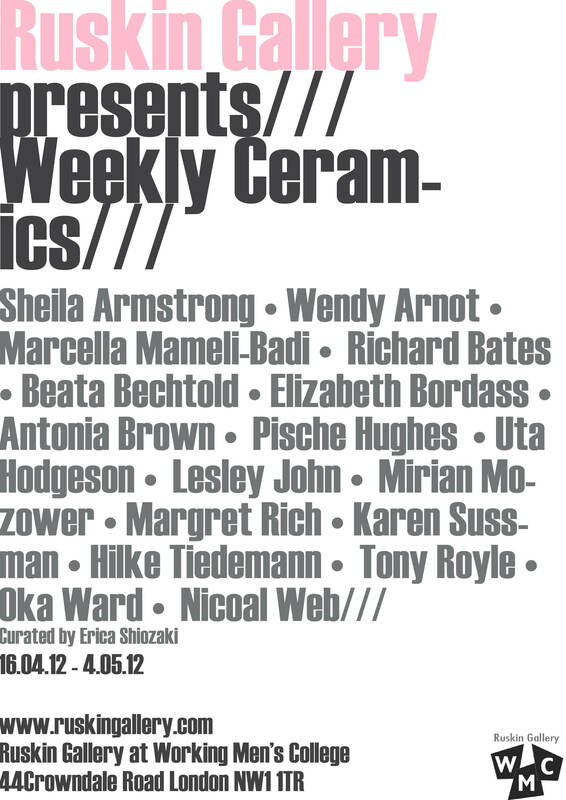 Ruskin Gallery at Working Men’s College is pleased to announce the upcoming exhibition by ceramicists, including Sheila Armstrong, Wendy Arnot, Marcella Mameli Badi, Richard Bates, Beata Bechtold, Elizabeth Bordass, Antonia Brown, Pisched Hughes, Uta Hodgeson, Lesley John, Mirian Mozower, Margret Rich, Karne Sussman, Hilke Tiedmeann, Tony Ryle, Oka Ward and Nicola Web. As the title of the show suggests, the exhibition will be changing weekly to expose different artists and their approaches to the medium of ceramics. In so doing, the collections of works also aim to pronounce the fleeting nature of exhibitions, contrasted by the solidity of some of the bigger ceramic pieces. Everything is ephemeral. An artist once commented that all works of art should be lived with, experienced with for a long time to realise the beauty of it – yet on the other hand there is still a great aesthetic in the short moments of pleasure that is strengthened by its elegiac quality, which is best captured by ceramic objects. For more information about the artists and for images of their works, please contact Erica at EricaS@wmcollege.ac.uk or through http://www.ruskingallery.com. The Ruskin Gallery is located at the Working Men's College in Camden. Ruskin Gallery is a contemporary gallery located in the historic building of Working Men’s College in Camden. In addition to providing students the opportunity to show at a professional level, the exhibition programme at Ruskin Gallery involves inviting external artists for site specific projects. The Ruskin Gallery is run by curator Esther Windsor, who is a curator, artist and writer living and working in London. Working Men’s College (WMC), the oldest surviving adult education institute in Europe, was founded in 1854 and was associated with the Cooperative Movement and the Christian Socialists, stemming, from the same tradition that led later to the Worker’s Educational Association. The Working Women’s College, founded 10 years later in 1864, finally merged with WMC in 1967. Early supporters of both have included F D Maurice, John Stuart Mill, Tom Hughes, Dante Gabriel Rossetti, John Ruskin, Ford Maddox Brown, Walter de la Mare and Octavia Hill. Originally based in Red Lion Street, we have been in this listed building in Camden Town since 1905. We have continued to develop the tradition of liberal education and today the College serves the whole community, with women, unemployed and refugee students forming the majority of the student body. We have grown rapidly in recent years but are still small enough to know all our students and to respond to their individual needs. WMC was designated as a Specialist Designated Institution (SDI) under the 1992 Further Education Act.